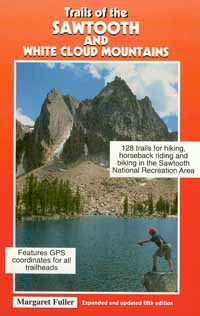 “Trails of the Sawtooth and White Cloud Mountains” by Margaret Fuller, Trail Guide Books, $20.95. Margaret Fuller has been hiking since her father took into the Sierra Nevada Mountains of California when she was 3. This summer, she released a revised and expanded version of her hiking book "Trails of the Sawtooth and White Cloud Mountains," offering a fifth edition to avid hikers who like to venture into the backcountry of the Sawtooth National Recreation Area. The new edition features GPS coordinates for all the trailheads. The book contains descriptions of 128 hikes, includes 62 maps and 60 photos and has been updated with the latest information available, mainly from Fuller's hiking experiences. Fuller said the book has always been controversial because it gives away some of the places to hike that many Idahoans like to keep secret. She said she traveled to all of the trails in her latest book except two of the trailheads. Several of the trails she has hiked many times, and she added two new trails. Fuller said she subtracted a hike she has presented in past editions because it was plowed under. Fuller consulted with the Sawtooth National Recreation Area rangers about the changes they have made including moving the upper Hell Roaring trailhead down the road a mile and building a new trail section there. Fuller is very detailed in her hike presentations, listing travel distance, trail etiquette, trail connectors, elevation gains and prominent features to seek such as distance from a lake or river crossing. In addition, she lists the time the hike will take and its difficulty. However, Fuller's most descriptive hiking information is her attention to flowers, trees and terrain details. She is specific on what the trail will look like at certain times of day and she provides interesting facts about names of places and peaks. Fuller and her husband, Wayne, a retired district judge, have lived in Weiser since 1985. They have five children and seven grandchildren. Fuller was born and raised in California. Fuller has five Idaho trail guidebooks to her credit, including "The Weiser River Trail: Idaho's Longest Rail Trail," written with Anita Van Grunsven. This book, too, has been updated in a second edition. The trail runs 85.7 miles from Weiser to just south of New Meadows. As hikers travel north on the Weiser River Trail, the views change from open farming country to sagebrush hillsides to dense forest. The many wooden trestles of varying heights make the trip an adventure. The book has color photos and maps, its pages are laminated, and the binding is a sturdy spiral. It is published by the organization responsible for that trail, the Friends of the Weiser River Trail, and retails for $15. Fuller's books can be purchased in Ketchum at Backwoods Mountain Sports, Chapter One Bookstore, The Elephant's Perch, Iconoclast Books, Lost River Outfitters, Silver Creek Outfitters and Sturtevants. In Hailey, they are available at Lost River Sports and in Stanley at Jerry's Country Store, McCoy's Tackle, Mountain Village Merc, Riverwear, River One and the Stanley Museum. Smiley Creek Lodge, Redfish Lake Lodge and the Sawtooth National Recreation Area also sell Fuller's books.